And it's a lot: The annular eclipse with the smallest lunar/solar diameter ratio of the 3rd millennium (or the thickest ring - or the longest duration when near the point of maximum eclipse) of 15 January has been observed widely all along its track from Central and Eastern Africa over the Maldives, India, Sri Lanka, Bangladesh, Myanmar and China, and pictures and reports are still coming in 9 days later. Thanks to TwitPic as well as eager Indian journalists, the small tour led by yours truly to Varkala, Kerala, India, and our results were mentioned quite often; these links are marked by an asterisk (*). From the Central African Republic come this, this and this image, from Uganda a spectacular video with Baily's Beads and a report and from Kenya a picture from Mt. Kenya at almost 5000 meters, a report, some pictures (more) and a report from Lake Nakuru, and from Nairobi a report. From the Maldives we have reports and pictures from Male (more), Ellaidhoo (APOD), Summer Island Village, Club Faru (more), Rangali and Meerufenfushi (more) - while a diver was caught by surprise. On a ship off the Maldives the eclipse was also observed during India's first-ever eclipse cruise. 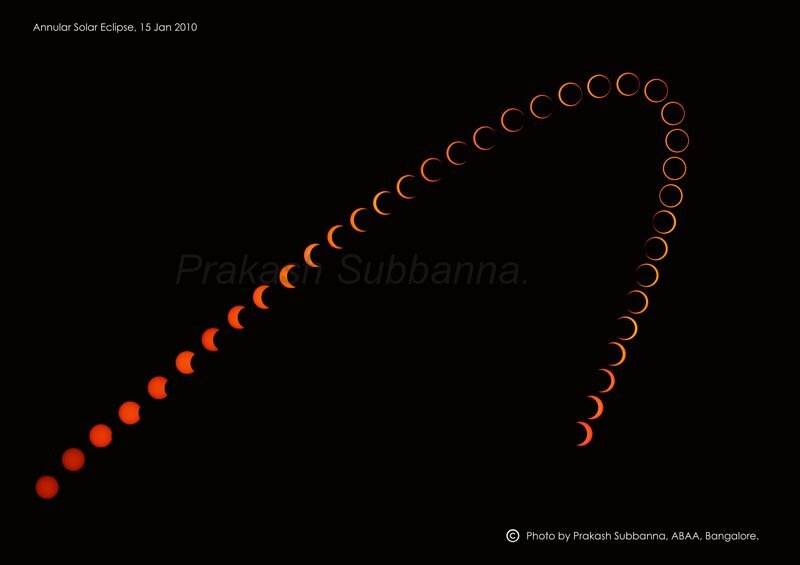 From India a Wiki on the eclipse (announcement) and a very detailled report by S.P.A.C.E. on events all over India (picture collection; alt.). From Varkala near the Northern edge pictures by yours truly* (access the earlier ones through the thumbnails on the right), T. Kampschulte*, W. v. Kerkhof* and a S.P.A.C.E. 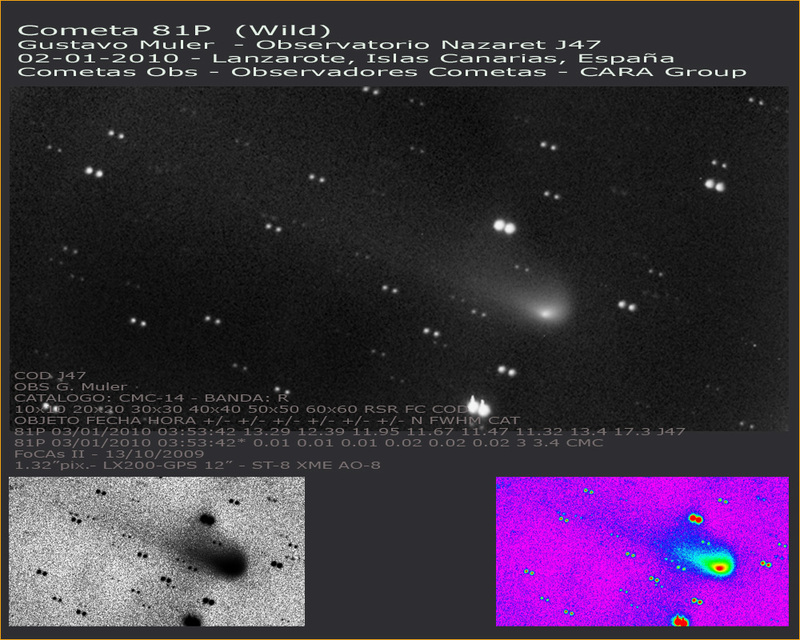 expedition: a Beads composite (two single images and a recording of their webcast). Also a report by accidental tourists. From Thiruvanantapuram & Kovalam these and these pictures, a report and a another one. From Rameswaram & Dhanushkodi a looong report (more, more and more) and pictures here (used for this funny composite), here, here, here and here. And from Kanyakumari a report (earlier) and pictures here, here, here, here and here. From Sri Lanka a blog report, another and another one (pictures; preparations) from a politically charged trip to Jaffna, where also these pictures come from. Plus a commentary on new vs. old media coverage of the eclipse. From Myanmar these and these pictures from Shwe Bo City. And from China a collection and pictures and reports from Shenyang, Weizhan Lake, Qingdao, Zhengzhou and Kalfeng. Some impressions from the zone of partiality come from Pune, Bhuj, Bangalore, Delhi (more), Manila (AAPOD - clever setup; more), Beijing (another surprise observation; more) and Sounio. News coverage of the eclipse was generous - first from individual countries. From Uganda this story. From the Maldives this story and a strange one (relating to this fringe science). From India a TV debate on eclipse superstitions (also this clip) and stories here, here*, here*, here*, here* (more*), here*, here, here, here (alt. ), here, here, here, here, here, here, here, here, here, here, here, here, here and here. Specifically about sounding rockets fired for geophysical studies during the eclipse are an ISRO Press Release and stories here, here, here and here, while here lots more stories are linked. From Bangladesh stories here, here and here, from China this and this story, and stories about the eclipse worldwide here* (alt. *, alt. *, alt. *, alt. *, in Spanish* and in French*), here*, here*, here, here, here, here, here, here, here, here, here, hier, hier, hier, hier*, hier, hier und hier. The eclipse led to a brief surge in web searches; many more pre-eclipse stories can be found here! 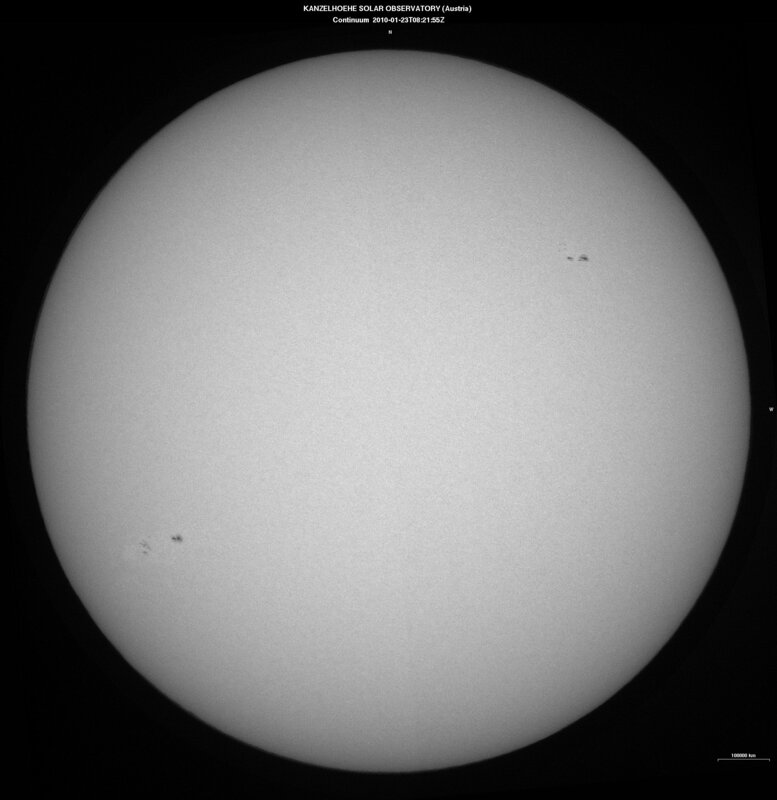 In other Sun-related news the sunspot situation on Jan. 23, the big group #1040 (earlier) which was also visible during the eclipse. • There is also a new method to predict flares, and during recent total solar eclipses the corona has been imaged in a new light by Fe XI. • From the partial lunar eclipse preceding the ASE we have further pictures from the Philippines taken with unusual equipment (an AstroScan!) and from India (more, more). • It is also noteworthy that the upcoming full moon will be the biggest of the year. A small asteroid came moderately close to Earth (with some speculation that it may be related to the Venus Express mission): NEO News (alt.) about 2010 AL30, a radar detection, the Cosmic Diary (earlier), Remanzacco (earlier), Transient Sky (earlier), Planetary Society (earlier, still earlier), SpaceWeather, KosmoLogs and news coverage e.g. here (blog), here, here, here, here, here, here and hier and pictures and movies here, here, here and here. • There has been an arrest in connection with the 2008 TC3 meteorites in Sudan (also here and here). • A meteorite hit a dentist's office in Virginia, as reported here, here, here, here, here, here and hier - and another meteo-wrong. 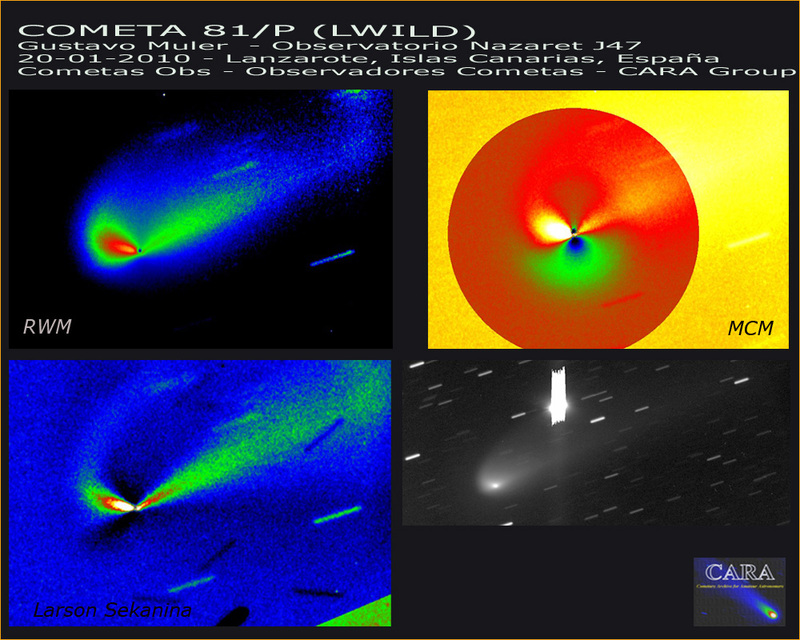 The Curious Case of Comet P/2010 A2 (LINEAR) is discussed by TransientSky, Discovery, AstroEngine, S&T and AstroFan80 - did we witness a collision in the asteroid belt? 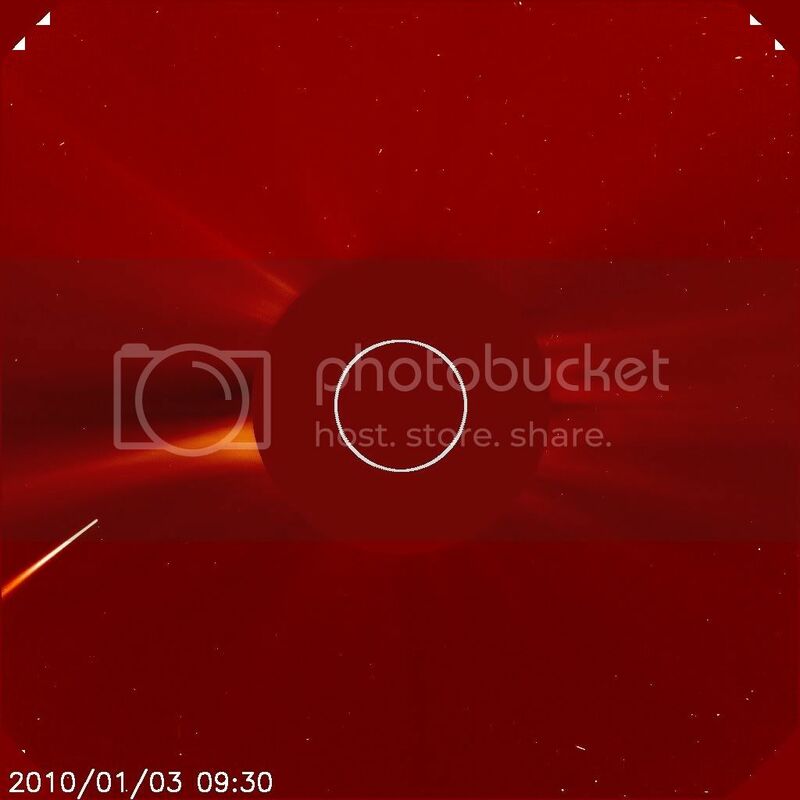 • There was another sungrazer, quickly gone, while from the previous one we have further pictures & videos, a report (more), a movie (hectic and alt. versions) and stills from C2 (more) and from C3. 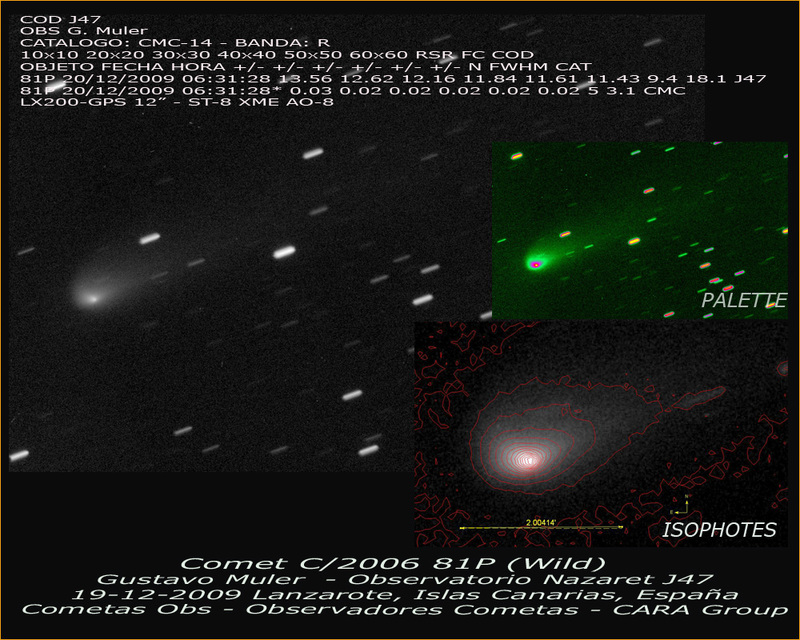 • Comet C/2007 Q3 with a globular cluster (NGC 5466), and 81P/Wild on Jan. 20 and Jan. 2. Bright sungrazing comet in SOHO's field of view right now! Jan. 29 the opposition of Mars, shining at -1.3 mag. with a 14" disk (on which a lot can already be discerned; see below). There are also a preview for the full year and a lot of links to reviews of the past one. (In other comet news a lot of great Halley pictures from 1985/6 have now been scanned and put online; from current comets we have C/2007 Q3 on Dec. 25 and 81P on Dec. 19). In other news the ZHR profile of the Geminids of 2009 can be interpreted as a drawn out plateau of perhaps a double peak - in any case, most of the activity came many hours early! There is one famous picture (explained here), a composite shows 34 GEM in one view (more composites) - and an IMO spokesman on TV! • A bolide in China may have dropped meteorites - and the hunt is on again after an old fall in the U.S. • A star occultation by (599) Luisa was very well observed in Europe: reports here (ctd.) and here. • 2009 YE9 is the biggest KBO find in 5 years, among many hundreds. • The partial lunar eclipse of 31 Dec. or 1 Jan. was a webcast-only event for many, but great pictures were possible e.g. in Athens, the Philippines, Mallorca, Malaysia, Spain, Dublin, Sri Lanka or Chennai (more previews here, here, hier, hier or here; some don't get it at all, though ...) • From the July 22 total solar eclipse a Japanese satellite view, Indian picture collections and a late trip report. • A stellar occultation by the Moon observed in India. • Solar activity is finally rising, at least w.r.t. the number of non-spot-free days ... December brought something to see indeed, on the 19th, 18th (at sunset), 17th, 16th (more, more; earlier) and 15th (more, more and a movie until the 15th). • Also the "fingerprint" of the new cycle, how the low EUV flux cools the upper atmosphere, how the Sun is innocent in global warming (more) and 10 years of AcrimSat monitoring the solar 'constant'. • Great hi-res views of Mars from Jan. 1, Dec. 29, Dec. 28, Dec. 27, Dec. 14 and Dec. 5. • Mercury, Jupiter and Moon constellations on Dec. 21 (more), Dec. 20 (more), Dec. 19 (all three from Oz), Dec. 18 and Dec. 17. • Jupiter & Neptune on Dec. 25 and Dec. 11. • Epsilon Aurigae images and reports of Dec. 19, Dec. 15 and Dec. 14 and a Delta Cephei lightcurve obtained with a simple digital camera. • Deep sky drawings from India. • An accidental green segment image. • A winter star party ... in Austria! • A Dark Sky Park in California. • And Indians going for Jovian radio emmissions.